Origins of the railway line. The railways in the State of Victoria, prior to 1883 had all been privately owned. The State Government then established the vertically integrated Victorian Railways Department in 1883. In 1884 the Victorian State Parliament passed The Railway Construction Act, which authorised fifty-nine new lines to almost every corner of the state, and thus became known as the Octopus Act. The railway line discussed here was originally to be known as the Wandong, Heathcote, Sandhurst Railway line, and later called the Heathcote Junction to Bendigo railway or the Wallan to Bendigo service. It was to be a cross country line, and was constructed between 1887 and 1890. The route for this cross country line would begin at a site now known as Heathcote Junction, on the now Victorian Melbourne – Wodonga railway line. The planned route would to pass through the community districts and towns of Bylands, Kilmore, Willowmarvin, Moranding, High Camp, Pyalong, Tooborac, Heathcote South (Argyle), Heathcote, Derrinal (Wild Duck), Knowsley, Axedale, Axe Creek (Longlea), Strathfieldsaye, Junortoun, and end at Sandhurst (North Bendigo). This railway route would have its beginnings when survey planning in 1886 finally selected the location of the former ‘Summit’ railway siding, as the branch point from the main North East railway line (Melbourne to Wodonga). This branch point and its station would be known as Kilmore Junction and then later named Heathcote Junction (1922). There were three principle contractors to the Victorian Railways for the building of this branch line. Contractor G.Buckley and Co. was awarded a contract for the sum of £91,996, being for the first distance of nine miles and forty chains (15.2Kms) from the North East line to a new Kilmore station, on 10 January 1887. McDermott & Sons would later win what must have been a re-advertised contract, to build a 29 miles 72 chains (48kms) section between Kilmore and Heathcote East, for £115,024 88-16-5 on 18 June 1888. Previously on 10 January 1887, the 27.9096 miles (45Kms) section from Heathcote to Sandhurst had been awarded to Andrew O’Keefe of Barnadown, for the contracted sum of £88,409-16-0. The O’Keefe contract stated that construction was to be fully completed by 30/04/1888. Various sections of the whole line would be completed between 1888 and 1890. When all the various contracts and works were completed, the line would be 60lb single gauge line with a total length of 68 miles and at a total cost of £389,887. Where this cross country line connected with the Melbourne-Murray River (Echuca) railway line at Sandhurst, the rail distance to this junction point from Melbourne was 100 miles, 74 chains & 34 links (approx. 164.96 kms) via Heathcote Junction. Edward O’Keefe arrived in Victoria from Ireland in 1854 and moved to Sandhurst goldfield in 1855 with his wife & two children, one being Andrew (1842-1904). Edward later involved his son in a number of Edward’s public works contracts e.g. sub contractor with the Sandhurst to Echuca railway line (completed 1864), sections of the Coliban Scheme (a water system to Bendigo) commencing in 1867, and then Andrew worked on Sir Thomas McIllwraith’s contract on the Great Northern Railway Line (Melbourne to Sandhurst) building the Big Hill tunnel (390m long, completed 1860). Andrew then in his own right won his first railway contact for a section of the Wandong, Heathcote, Sandhurst Railway line (Sandhurst to Heathcote section, completed 1888), then built the Laanecoorie Weir (1889), the Eaglehawk tram line (1890), a section of the Great Southern Railway line (Korumburra – Toora) in Sth Gippsland (1891) to name a few, as well as being a landholder of the Adelaide Vale property (the largest cheese dairy in the colony, producing O.K. Cheese) near Muskerry-Barnadown, the Kimbolton Run, and three large station properties in the Riverina NSW. Andrew died in 1904, leaving 10 children. On 20 July 1888 it was reported that Andrew O’Keefe’s own locomotive pulled the first passenger train from Sandhurst to Heathcote and return, to attend a Masonic Lodge function at Heathcote. The official opening of this Sandhurst to Heathcote section of line (27.9 miles, 44.9 kms) was by the Honourable Duncan Gillies, Premier and Railways’ Minister on 4 October 1888 (a Victorian Railways record indicates this section was open on 1 Oct 1888). The construction of this section had taken 21 months to complete, 6 months more than was originally intended under the contract. The Kilmore Junction (later named Heathcote Junction) section of 9.51 miles (15.3 kms) was opened on 1 Oct 1888, the Heathcote to Tooborac section (10.56 miles, 17 kms) later opened on 3 Dec 1889 and finally the Kilmore to Tooborac section (20.11 miles, 32.36 kms) was opened on 22 Aug 1890. Another linking cross country line was to be built from this Wandong, Heathcote, Sandhurst Railway line, with its branch point at Kilmore. That line was the Lancefield to Kilmore railway line (18.1 miles, 29.13 kms) which was officially opened in 6 April 1892 (the Lancefield Junction [Clarkefield] to Lancefield line had previously been opened since 7 June 1881), and then to have the Lancefield to Kilmore section officially closed on 1 June 1897 (although it did reopen for another short period), giving it a continual service life span since construction of just 5 years! A Railway accident at Kurkurac Creek bridge (between Willowmavin and High Camp) – 4 November 1907. 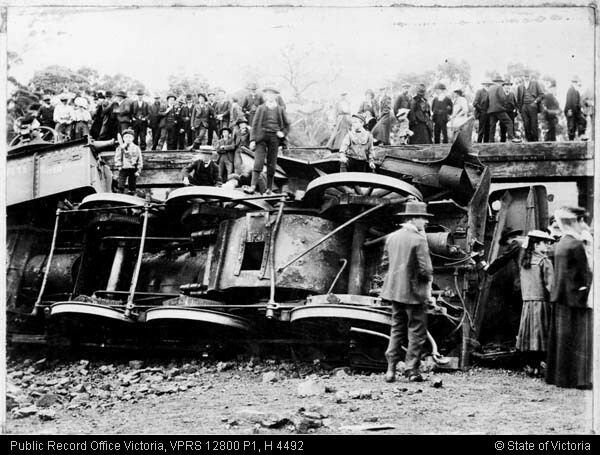 Reported as the worst train accident for the Victorian Railways at the time. The Wandong, Heathcote, Sandhurst Railway line initially ran separate passenger services as well as goods train services. The goods services were transporting local produce and supplies, plus timber, firewood and charcoal, to either to Bendigo (mainly for the gold mines) and Melbourne (mainly for firewood, until replaced by Latrobe Valley coal production). These separate rail services were to be then combined as one mixed train, with the decrease of passenger numbers, until separate passenger rail motor services were introduced. A Rail Motor turntable was installed at Heathcote (2 Feb 1926), as passenger services were to use the lower operating cost of the rail motors like the local ‘Beetle’, AEC, and the later Walker models. A number of other changes then started to occur, such as the Tooborac Stationmaster position being removed on 3 Sept 1931, and such change would continue. The passenger train service on this line Wallan to Bendigo would close completely from the 29 December 1941, with the local rail motor being shifted to service the Maryborough – Ararat line (probably due to WWII measures). In 1941-42 there still remained three goods services on the line per week. The Wallan to Heathcote passenger service was to return due to local agitation a year later, yet the Heathcote to Bendigo section would be goods only service. This section of line (Heathcote-North Bendigo) was to close on 3 Dec 1958, due to a new water reservoir being planned. Apparently consideration was given to constructing a new section of line in the area of the original McIvor Creek crossing, due to the new Lake Eppalock reservoir designed water levels that would flood the original railway line. Yet the line was deemed to be uneconomical for such expenditure, so this new reservoir would be the beginning of the end for this railway line! For this western section of the line, following the official 1958 closure of Heathcote to Bendigo section, the section to be submerged by the lake was lifted in early 1959. The Minister was to give his permission for the Heathcote to Bendigo line to be lifted in September 1961, and by January 1962 the line had been dismantled to beyond the crossing at 98 miles. A small section of the line would remain operational between the North Bendigo junction and the Rangelea branch line in East Bendigo/Junortoun until being booked out on 11 December 1986 (sections would be lifted between October 1988 and Feb 1991, with the last section close to the junction and the North Bendigo Workshops being lifted in April 1996). The last passenger vehicle to be on this short section of line was a ‘62-RM’ DERM Rail Motor special in 1982. The Wallan to Heathcote train services would continue to operate for a further 10 years, the last regular passenger service being run on 20 June 1965 with a Walker rail motor. The last regular goods service was to run on 6 Nov 1968. With this service closure, the transfer of railway staff away from Heathcote followed, as Stationmaster Mr John R Mcquillan (later awarded an M.B.E., related to the Violet Town disaster) was transferred to Violet Town, Assistant Stationmaster Mr. Jack Tobin to Kilmore, Driver Bill Clugston to Sunshine, Driver Alex Mackenzie went on leave and Line staff members Ken Hutchinson & Bruce Lennox transferring to Bendigo and Shepparton. Finally a special Australian Railways Historical Society (ARHS) excursion passenger double locomotive steam train ran from Spencer Street station Melbourne to Heathcote on 9 Nov 1968, and this would be the last full passenger train to run on the line. The last goods type train (T348 diesel electric loco) ran on 14 Nov 1968, some ten years after the closure of the western section, collecting rolling stock that still remained along the line. One of the main goods that were carried on this railway line was timber, primarily for both gold mining activity in Sandhurst /Bendigo, firewood and charcoal for a fuel in Melbourne, and railway sleepers. Timber saw mills and yards were located at Heathcote South/Argyle, Heathcote, Derrinal, and Knowsley station yards, with the timber being loaded directly into the goods wagons. There was also timber being transported from a private tramway and saw mills that had a siding at Tooborac. This private company was the McIvor Timber and Firewood Company that had commenced operations in 1906. This company built a 5ft 3in (broad gauge) tramway network, that branched off the main line at Tooborac (between the now Majors Line Rd and the Seymour-Tooborac Rd). Timber was cut from the area to the east of Heathcote and also this was to extend as far to the north as Cherrington and as far to the east as Puckapunyal. Two American Baldwin locomotives (named ‘Major’ and ‘McIvor’ – one such photograph is in Tooborac Hotel) worked the tramway, with a Victorian Railways’ turntable being installed in the Toobarac Station yards (noted as officially operational on 16 Nov 1908). The McIvor Timber and Firewood Company locomotive engine shed still remains standing in the former yards near Majors Line Rd Tooborac, as does the company manager’s residence. The VR trains were only allowed to travel a set short distance into the yards, with this ruling allowing the train driver to only enter this siding with no more than three trucks maximum. This tramway network, which was about 22 miles (35.4 kms) in total length, ceased operation in 1927 with the demise of the company. An attempt was made to sell this network to the Victorian Railways at this time, yet that offer was rejected by the Government. Subsequently the network line was lifted and all was recovered or demolished. From investigations to date, there were railway stations and platforms located at districts and towns of Bylands, Kilmore, Willowmarvin, Moranding, High Camp, Pyalong, Tooborac, Heathcote South (Argyle), Heathcote, Derrinal (Wild Duck), Knowsley, Axedale Racecourse, Axedale, Axe Creek (Longlea), and Strathfieldsaye (Homebush). Specifically between Bendigo and Heathcote there were a total of 13 stations, platforms and sidings, yet not all were operational over the whole life of the railway line. These sites became known as the Argyle (formally Heathcote South) Railway Station, Heathcote Railway Station, Derrinal (initially ‘Wild Duck’) Railway Station, Knowsley Railway Station, Trench & Co. Siding, VA Dean/Ingham Siding, Axedale Racecourse Station, Axedale Railway Station, Longlea (formally ‘Axe Creek’) Railway Station, Strathfieldsaye (named Homebush during construction) Railway Station, Rangelea (initially Commonwealth) Siding, Rifle Butts Platform, the Bendigo Freezer Company Siding and Carr Fowler Construction siding. The Rangelea siding was built for the Department of Defence, who established the ammunition storage facility and proving range in 1942. The siding was opened for traffic in January 1943, initially known as ‘Commonwealth siding’, it was renamed ‘Rangelea siding’. The main siding also had a dead end spur siding to the Army’s proving range. Apparently certain guns and associated products made at the Bendigo Ordnance Factory were transferred via rail to this area with its large gantry for testing. The former main siding’s railway platform and building now appear as the only remaining non residential railway related structure in its original location for the entire length of the original line. While these structures are in good condition, this area remains restricted access to the general public. The Bendigo Freezer Company siding (located just west of Pratts Park Rd East Bendigo, near the present Mayfair Industrial Estate) at 99 miles, was fully completed on 3 February 1922, with a stock unloading platform adjacent animal holding yards and the line built into the factory complex buildings. The site was taken over by the Victoria Inland Meat Authority (VIMA), then later Canada Packers (Aust) Pty. Ltd. The factory became know as ‘Mayfair’, then when this closed as a meat processing factory, it was converted into a multi use industrial area renamed ‘Mayfair Park’. The stock unloading platform, with its two movable (using a small rail on top of the platform) unloading ramps, remained virtually intact until 2013 when sections of it were demolished prior to proposed industrial land development. The siding was booked out of service in December 1986 and probably lifted when the North Bendigo to Rangelea section was lifted. The Carr Fowler Construction siding was located between Rohs Rd and Murphy St East Bendigo, being officially opened on 2 February 1963 (although not fully completed until 22 May 1963). The siding was used for deliver of bulk tanker products, and noted as not used for a number of years in October 1986. The Carr Fowler company came under the control of the Boral company. When reconstruction of this site and equipment did occur, and the removal of the adjacent railway, it is understood that the siding’s rails/sleepers that were located within this private property were not lifted and still remain under the fill and asphalt today. One of the major items of railway infrastructure required to be built for any railway line were the means of crossing waterways, roads or going through hills. The crossing of waterways could be a small brick or timber constructed culvert up to a large pile (‘trestle’) bridge designed to spanning hundreds of feet. The Wandong, Heathcote, Sandhurst line was no different, with the section that Andrew O’Keefe was contracted to build having a requirement for fifty bridges, not counting road crossings. Such bridges needed to cross small waterways, as well as larger ones like the Mt Ida Creek, the Campaspe River, Axe Creek, Sweenies Creek and Grassy Flat Creek. Contractor McDermott & Sons had to construct two significant sized pile timber bridges to cross the Mollison Creek (then known as the Pyalong Creek) and the Hanford or Percival Creek at Pyalong. Both these bridges consumed a significant amount of quantity of timber, their dimensions being considerable. The Mollison Creek bridge’s length being 411 feet (125 metres) with 27 openings at approx 15 feet (4.57 metres) apart. This bridge’s height above the creek bed varied of course, having an original height of approx 50 plus feet (15 plus metres) at its centre (this height increased over the following decades due to scouring of the creek bed taking place). Sleepers on top of this bridge numbered 185 in total, each at a length of 7’6” placed in gravel ballast. The actual railway line was separately supplied by Victorian Railways, and was the 60lb weight graded line. 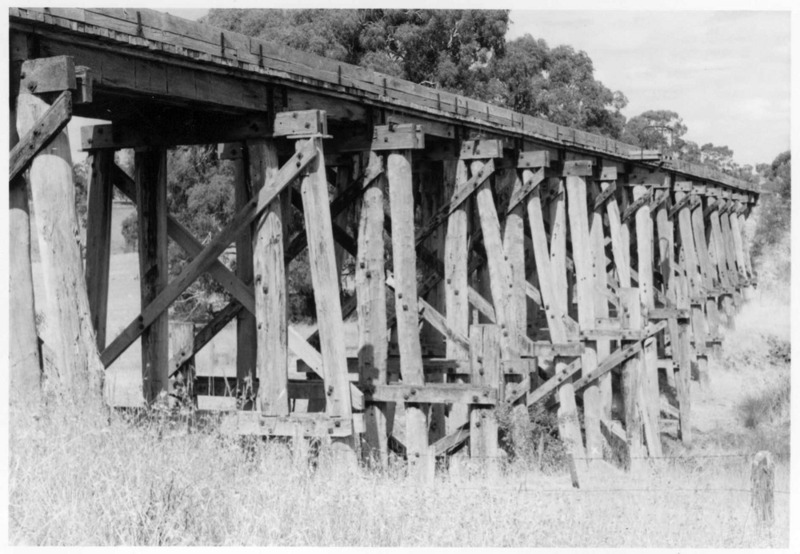 The two timber bridges at Pyalong were believed to have been completed in 1888-89, with this section of line opening in mid 1889, and both bridges having now survived fairly much visually intact after 124 years. Both remain a tribute to the original 19th century engineers and skilled workers who designed, built and maintained them. In 2010, to determine both these bridge’s condition, a full engineering assessment was funded and carried out early in 2011. This assessment found that most of the timber elements of both bridges to had significant reduction of structural integrity. The Victorian Railways’ original plan records having recorded major replacement of structural elements such as piles, walers, cross heads, beams, and braces occurring in the 1920s & 30’s. So after a period of reduced normal maintenance, then more than 50 years of neglect since the railway closed, both these bridges are in a precarious state of possible collapse and possible loss to the local community and general public. Their ultimate fate in the 21st century will depend upon the community, the various interest groups, as well as responses by the various levels of government of the day. The dismantling of the whole line took place within two main periods, over a 20 year period. For the Heathcote to Bendigo that section of line was officially booked out of service on 3 Dec 1958 (the ‘right down’ cost, less depreciation, being £735), due to the construction of the new Lake Eppalock reservoir (construction 1961-64) and its planned water level height. The portion of the line to be submerged by the lake was lifted soon after its closure, early in 1959. Minister gave permission in September 1961 for the closed section of line to be lifted, with dismantling of this section to the crossing beyond the 98 mile (Rangelea siding junction) being completed by January 1962. About thirteen years would pass before the Victorian Government would pass Legislation in April 1975 to dismantle the line and its associated infrastructure, with the Act stated that the line ‘no longer existed’. Following this, the loss of one local icon that caused much feeling within the community at Axedale at the time, would occur. 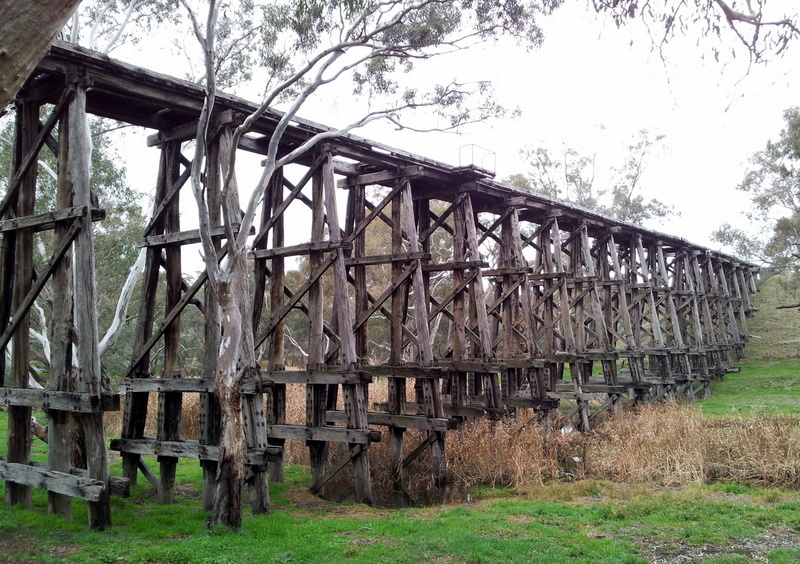 This was the timber railway bridge over the Campaspe River. When the building of this bridge was originally finished, by contractor Andrew O’Keefe, it was a significant timber structure at over 2000 feet (610 metres) long and crossed over both the river and its adjoining flood plain. Specific quality timbers for the tall piers and piles were required under the original contract, and these were finally sourced from Newcastle in New South Wales. Following the dismantling of this bridge on the western side of the river in 1972 (this was well before the official 1975 Bill was passed by the State Government, apparently stated at the time removal was for public safety reasons…..or was it to clear this ‘obstacle’ from the golf course! ), there remains very little of the 80 feet (25 metres) section of the bridge that was above the Campaspe River. Where this bridge once crossed the Axedale Recreation Reserve /Axedale Golf Course, there are no visual signs except for the bridge’s western end abutment. Little signs also of the nearby Native Creek railway bridge (No.21 at 88m 25c 12l), located where the alignment now crosses the Kimbolton-Axedale Road, except for its earth abutments. Yet as a small reminder of the remarkable 19th century Campaspe River structure, there are some well weathered timber piles, walers and cross heads that do remain standing (subject to termite activity!) on the adjoining ‘Maryvale’ property, to the south-east of the original river crossing. There are also some pile and concrete support foundations remnants that are still within the bed of the river. By the time the last A.R.H.S excursion train travelled from Spencer Street Station Melbourne to Heathcote on 9 Nov 1968, the sections of Heathcote to Bendigo line had long been lifted and removed. The 1975 act of Parliament would see the sale and removal of the remaining infrastructure that had marked this railway line. Again, once the administrative work was completed, most of this railway infrastructure was quickly sold off and mostly removed. Very few VR buildings were to survive at their original location, although the Stationmaster house at Bylands and Tooborac, and the gatekeeper cottage in Mitchell Street Heathcote are a couple examples. Interestingly, when the ‘Heathcote Railway Removal Bill‘ was passed by the State Government in 1975, it made specific provision for the preservation of the two National Trust classified bridges at Pyalong. This related to the spectacular 1889 Mollison Creek pile bridge (at 56m 25c 00l) and 1888 Percivals or Hansford Creek timber pile bridge (N0.71 at 54m 26c 89l). The Bill allowed for setting aside an area around both bridges as Crown Land, as it was anticipated that a Committee of Management (CoM) would be established to have control and responsibility over the maintenance of both the land and the bridges. Sadly, it does not appear that a CoM was established, and no maintenance carried out on either bridge for the following 40 years. Both bridges are now in poor condition, the Mollison Crk bridge showing serious signs of imminent collapse, with community apathy turning its back on any attempts to save these classified bridges! Sadly, the long Campaspe River timber bridge did not get the same attention from this State Government Bill, or the local community’s representatives. Identified items of railway infrastructure to remain are few, yet these hopefully will remain in some form in the future. 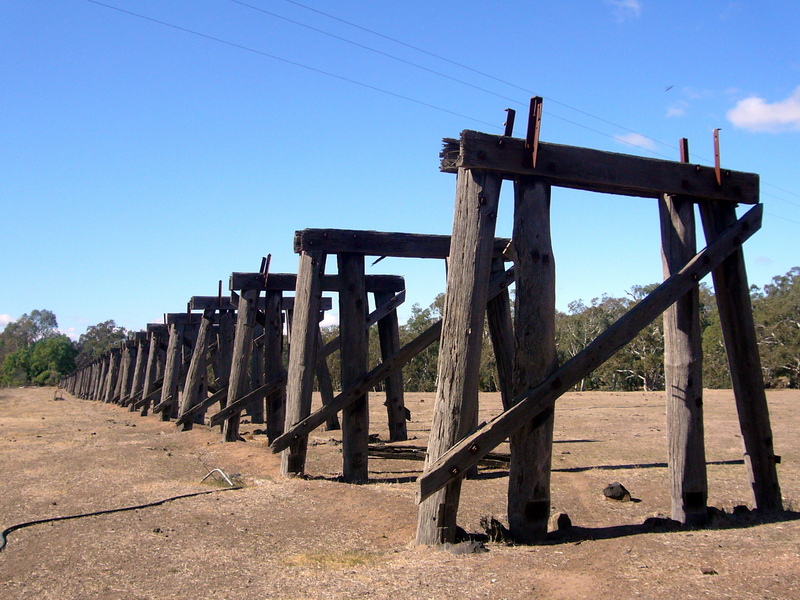 Such as a buffer block at High Camp, the base foundations of the Tooborac turntable (still operational in November 1968, yet had been rarely used after goods steam locos were replaced by diesel locos in 1964), now intact spectacular Mollison Creek timber pile bridge and the equally significant Percivals or Hansford Creek timber pile bridge at Pyalong, the reduced section of 1888 Wattle Creek timber pile bridge (west of Flea St Heathcote) that is now in an advanced stage of collapse, an intact unnamed 1955 concrete bridge in the One Eye Forest (to the west of Heathcote), remains of the Campapse River bridge, and the 1887 timber Grassy Flat Creek bridge (East Bendigo) restored as a trail bridge in 1999. Of course most of the railway line’s earth formation can be seen from the McIvor Highway and Northern Highway, snaking its way through the landscape. Yet to the untrained eye, virtually little was left to identify this once important cross country rail transport route that had linked many communities for nearly 80 years. So the pieces of a railway ‘jigsaw puzzle’, the steel railway line, spikes, plates, sleepers, ballast, water towers, turntables, cranes, buildings, station platforms, goods yards & roads, signals, tanks, sidings, gates, bridges, telephone line & poles, mile posts, various signs, etc have for all intended purposes been removed. Not only was the physical infrastructure sold, so too was much of the railway land as well, although certain sections of land were initially retained in the public’s ownership. The Strathfieldsaye Shire Council was one council at the time that had the foresight to purchase the whole railway reserve within its boundary (Crows Rd Axedale to McIvor Rd Junortoun). While other councils like the McIvor Shire and Pyalong Shire were not so interested in having ownership of such land, and so the railway reserve within those Shires was offered to the adjoining land owners or others for purchase or lease from the Victorian Railways. The Victorian Railways did not retain ownership of any sections of the previous railway land between Bendigo and Kilmore, yet did initially retain land ownership between Kilmore and Heathcote Junction where some sections of that original reserve are managed by VicTrack (State owned enterprise). Certain other sections were retained as Crown land, such as within forests reserves (e.g. One Eye Forest, Knowsley Forest, timber bridges at Pyalong etc), and managed by the Department of Environment, Land, Water and Primary Industry (DELWP). A more detailed historical research collection relating to this railway is available from ‘Axerail‘, by author Kevin Crockett. Railways and Pastures the Australian O’Keefes, Author: Mary Healy. Victorian Railways bridge design plans (No.24 & 71). This is fascinating. Every time I go to Bendigo and back I wonder who built the railway what for, where did it really run, and when, and of course when was it last used? Thankyou so much for all the careful research and hard work involved in accumulating all this wonderful information…..
Often wondered what happened to this line. As a youngster I often took the mail bags over to the Tooborac Stn. to send off or pick up from the Rail Motor.I remember the turntable, Station Masters Residence and the Goods Sheds, as kids we often picked up pieces of coal to take home and put in the fire. My parents had the General Store for a few years and I remember Dad taking us for a drive once and showing us the crashed rail motor that I believe hit a truck on a road crossing. I am sure there are some slides somewhere of that and the construction of Lake Eppalock. We would be very interested in any material you may have regarding the Bendigo to Heathcote Juncion line. Old photos etc would be much appreciated by our friends group. Sorry for the delay with a reply, I have been away at my parents place (both still alive ,Dad is 90 on Monday), next time I am there I will check out the slide box for some photos. There are probably no shots of the station ( I think the SM’s name was Sewell ) but there should be some of the old rail motor accident as well as the construction of Eppalock Dam. There is a lot to go through and I don’t think they are sorted as there was a spill once and they were just put back any old way. I would like a sketch plan of the Tooborac siding if you know how/where I would be able to get one. Hi great site .The last station master wasn’t Mr E Mcquillan it was Mr John R Mcquillan M.B.E. awarded from the Violet Town disaster. I lived in Ebden Street Heathcote – only a block away from the train station at the remaining years of the Heathcote Station. I still have vivid memories of the trains, although I was only 4 to 5 years when the trains ceased. There were a number of (yellow) station owned houses near the train station. These don’t exist anymore. It is such a wonderful thing that the memory and track be maintained. Many thanks to all involved in this project. Great to hear of your memory recalls Martin, about this past transport centre, the Heathcote Railway Station. Our group seeks any related history to this former railway that can be made available. Thanks for producing such a well researched, yet interesting piece of history. I live near the old Kilmore-Lancefield rail line, parts of which are still visible in the landscape. It seems unfathomable that such a short lived project could have been built by the government. I’d be interested in any further information you have about it. Meanwhile, I notice that a feasibility study for the Wallan-bendigo rail trail is being tendered by Mitchell Shire Council. Perhaps a project like this might direct some funds towards fixing those old bridges. There are publications that make reference to that specific railway line e.g. Farewell to the Timberline: Turton, and also related articles on web’s railway history pages. The Wallan-Bendigo Rail Trail feasibility study tender brief has no references to the former Kilmore to Lancefield line. 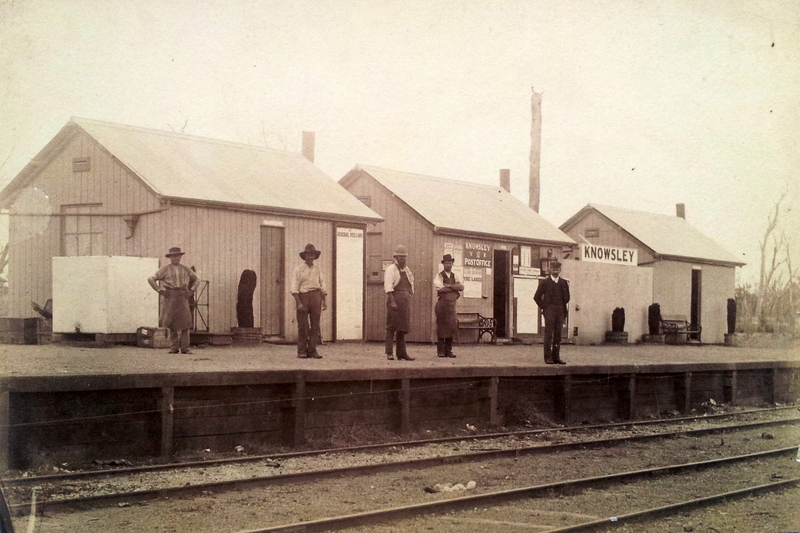 Looking for a photo of the Old Kilmore Station? Where exactly was it? Thats interesting and the last place i’d imagined it to be, i always thought it was somewhere near the Old Kilmore Gaol or the Kilmore Sale yards,as the crossing went over the highway just before the now Ford building, as a young girl i actually travelled to Kilmore on it with my grandmother, catching the train at Heathcote JUnction, my memory escapes me here, Can remember the commercial on the telly made on the line from Heatchote Junction…. My father Michael Larkins was the S.M at Heathcote during the early 1950’s.I can remember the local good’s train going through to Bendigo.Normally it was a D3 class loco. Also during the Korean war troop train would stop at Heathcote and the travelling troops feed after the meal being cooked in the rail yards. Timber was the main goods shipped by rail. Your exhaustively researched history triggered some nostalgia. Born in Kilmore, I lived on the (then) sheep property called ‘Craigielea’ on the Northern Highway, adjacent to the High Camp railway station. I can remember walking across sparse bush paddocks with my mother and sister (picking off wattle gum to chew as we went), and catching the blue and yellow liveried single motor car carriage to Melbourne on day return trips a couple of times before finally leaving to area in about 1949. Such occasions were a treat to a boy of between four and seven. I believe you can still partly trace the line’s course on Google Maps, but barely! I can also remember having to use Kilmore East station to either collect visitors or see them off. Most likely there were far more frequent services than ran through High Camp at that time? I was surprised that the last passenger trains that ran were as late as you document and that 1968 saw the ARHS run a final trip on the line. So interesting to learn too, the early building and extent of Victoria’s rail system. What a sad thought that their closures in many areas over the decades has probably inhibited regional growth as is now endeavoured by governments in relieving Melbourne’s and other city’s population concentration and congestion problems. My Uncle was Overseer at Craigielea Station in the 60’s, we spent many a holiday there, I remember the property was owned by a politician. On 19 November 1910, the driver of a goods train was killed after his train got out of control on the Heathcote branch line, as it descended the steep grade leading to the junction of the branch with the main North East railway line at Kilmore Junction (later known as Heathcote Junction). The air brakes on the train had become defective, so the driver and guard decided to use the hand brakes on the goods wagons to control the train on its descent. These proved ineffective and the train ran away down the grade. It was diverted on to a 66-yard (60 m) runaway siding which had recently been provided at the junction to prevent out-of-control trains from running on to the main line. When the locomotive hit the clay bank at the end of the runaway track it overturned, and the driver was fatally injured. This is a “cut and paste” from “Railways accidents in Victoria”. The driver was my great randfather James Ryan. He was killed “scalded to death” and was found in the wreck of the engine. It is in the Victorian State archives. The brakes has failed and the train was sent down a dead end line to avoid a head on collision with a passenger train. Fascinating article. As kids in early 1960s, once a year we used to have a weekend at the Axedale youth camp. We would spend the whole weekend down at the river and used to walk along the trestle bridge over the Campaspe which was fully intact at the time except for steel rails. There was also a very high trestle bridge over the main road which was removed in the mid-1960s. It’s amazing to hear that the line had only just closed in 1958 before my visits started in ’62. Lots of memories. how many steps in the Bendigo station from track two to track one — I had to use it yesterday and nearly didn’t make it to the top and the bottom.. Not built for 80 y o with cardio vascular disease! Hi Peter, interesting to hear of your experience at the Bendigo Station yet sorry it may not have been that pleasant. Suggest you might like to contact VicTrack or V/Line in the first instance, to find out about the currently funded project that will upgrade elements of the station and alter the means of connection between the platforms. From an historical view point, this overhead walkway between the two platforms was built in about 1868 for train passengers by Roberts & Sons a local foundry. So there would have been many who have used it over nearly the past 150 years. FYI, our community group of volunteers have no connection at all with the facilities that you mention. SORRY I was not blaming you you just seemed to be the most knowlegable to answer my question — as a columnist for my local paper I really wamted to know how many steps that bridge had?